This classic looking ChrisCraft bowrider is in very good condition. It is powered by a smooth shifting Volvo 5.0L GL with SX outdrive. Nice clean family sports and entertainment boat. This bowrider has a large bow and rear seating area, two bucket seats and newer bow/cockpit covers. It comes with a stereo, full instrument panel, in floor storage compartment, a swim platform and boarding ladder. The package includes a Tandem Trailer w/Brakes. 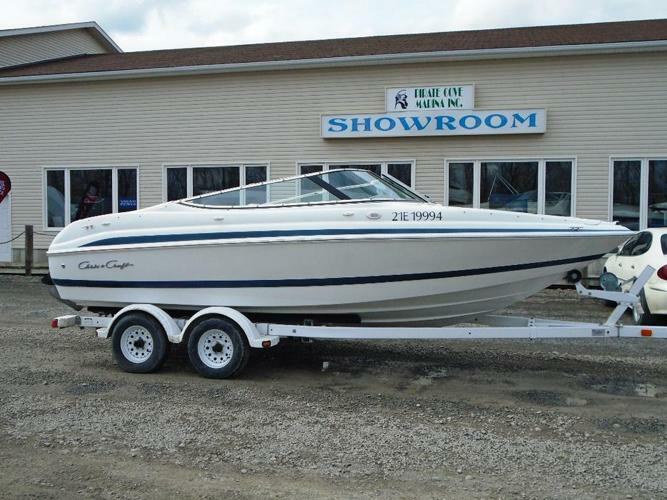 An economical fun boat, a must see! Copyright © 2019 usedboatsforyou.com, All Rights Reserved. Designated trademarks and brands are the property of their respective owners.